Joseph Quinlan is the managing director and chief market strategist at U.S. Trust, Bank of America Private Wealth Management. His research is frequently cited in such media venues as Barron’s, The Wall Street Journal, The New York Times and the Financial Times. With nearly 20 years of financial services experience, Mr. Quinlan most recently served as a senior global economist/strategist for Morgan Stanley. He started his career with Merrill Lynch. He lectures on finance and global economics at New York University, where he has been a faculty member since 1992. In 2006, the American Chamber of Commerce to the European Union awarded him the 2006 Transatlantic Business Award for his research on U.S.-Europe economic ties. In 2007, he was a recipient of the European-American Business Council Leadership award for his research on the transatlantic partnership and global economy. Mr. Quinlan regularly debriefs policy makers and legislators on Capitol Hill on global trade and economic issues. He has testified before the European Parliament. He has served as a consultant to the U.S. Department of State and presently serves as the U.S. representative (Economic Policy Committee) to the OECD for the U.S. Council for International Business. He is also a board member of Fordham University’s Graduate School of Arts and Science and serves on Fordham University’s President Council. He is the author, co-author, or contributor to eleven books. He has published more than 125 articles on economics, trade and finance. 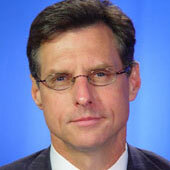 He regularly appears on CNBC, as well as Bloomberg television, PBS and other media venues.